In every food town there’s a restaurateur who helps set the bar for the entire city—not just for the excellence of the food, but for the very culture. In New Orleans, it’s John Besh; in Chicago, Paul Kahan; in New York City, Danny Meyer. In Boston, it’s Barbara Lynch, founder of Barbara Lynch Gruppo. Without so much as a high school degree, she has succeeded in the highly competitive restaurant world with a mix of scrap, savvy and passion, and now presides over an empire of eight operations employing more than 200 people. Along the way, Lynch, 49, has turned her intense focus on the “community” of her business as well as on the larger community of Boston. Lynch says she cooks what she loves and has always let that love guide her in building her own restaurants, starting with her first, No. 9 Park, in 1998. “I go with my gut and with what I think would be fantastic for the city of Boston,” she says. 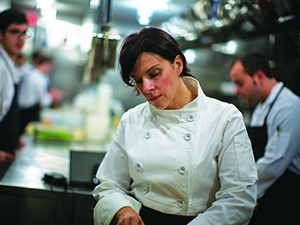 This attitude has helped her stay ahead of the curve and the competition, whether it was perfecting oysters and classic New England seafood at her B&G Oysters (opened in 2003), artisanal meats and charcuterie at her wine bar The Butcher Shop (opened later that same year) or craft cocktails and a reimagined Italian lunch counter at Drink and Sportello, respectively (both opened in 2008). “I have a fantastic team to help refine and execute my ideas, but I love the creative process of coming up with the idea, and it is always inspired by my life and my travels,” she says. Having this team in place has allowed Lynch to pursue her latest passions, including helping to take care of her local Boston community. Characteristically, there is a component of food to this, as well as growth and teamwork. Five years ago, Lynch started an informal “ladies who lunch” program to bring together people from the business community to network and learn from one another. It quickly grew to become the Full Plate lunch series, a monthly meeting of like-minded professional women, from bankers to architects to well-known luminaries. The desire to promote healthy eating also inspires Lynch’s latest business venture, and the fact that it evolved from an early misstep makes it classic Barbara Lynch. After opening The Butcher Shop, a wine bar and restaurant that also has a retail meat program, Lynch decided to launch an old-fashioned produce store next door. “But I didn’t do my homework,” she says. “People didn’t cook and shop like that, and there was nowhere to park, either.” Rather than let all of the fruits and vegetables rot, Lynch began experimenting with dehydrating them, first for her own family’s meals, and now as the basis for what she calls her “retirement plan”—high-quality, ready-to-use dehydrated produce packaged under the Barbara Lynch Made brand. “It’s so simple I wonder why no one else thought of it,” says Lynch, who put the idea on the back burner for several years while attending to Menton and other projects. Now she is working with a Rhode Island farmer and a packer to create summer and winter vegetable assortments that can be rehydrated in water or added as-is to stews, soups and other recipes. She already has made arrangements with schools, airport commissaries, shops and the military to supply these nutritious, easy-to-store and simple-to-use fruits and vegetables. Looking forward, she sees it as a way for farmers to turn potentially wasted abundance into a source of revenue. What key skills do you bring to the team? Devotion to the team effort. What is power, after all? It’s the ability not only to have a vision, but to get others to help you create it. This remains a man’s biz. How can it change? We have to change the way restaurants operate to make it easier for people to have balance—this isn’t just about women either. Why shun the "celebrity chef" mantle? I don’t compete with other people. ... My real focus is on building a great team and being recognized by my colleagues.